Contemporary Sapphire Engagement Ring : LOVE2HAVE in the UK! A beautiful handmade contemporary sapphire engagement ring from our lovely collection of sapphire engagement rings. 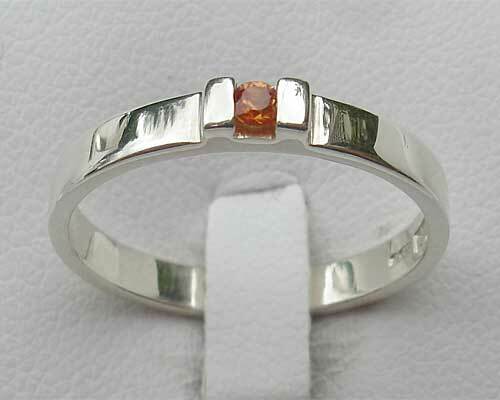 This contemporary engagement ring is set with an orange sapphire and is available in a matt or a polished finish. 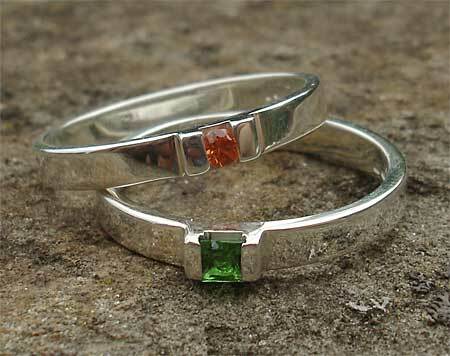 The silver is approximately 2.5mm in width which is a nice width for a lady considering one of our matching silver rings as a wedding ring to go with it. When combined the total ring thicknesses added together will still feel comfortable on the finger as they won't feel too wide and all at a price you can afford. The engagement ring is pictured here in a polished finish. The colour orange for a sapphire signifies empowerment for the creative individual. They offer inspiration and help fulfil burning desires. Orange sapphires mean unity, spirituality, love and wisdom. It is the colour for artists and those of a creative disposition also. Precious stone(s) Available: 1 x 2mm orange sapphire.